I adored my grandfather, it helped being his favourite grandchild but all the same, my memories of him are happy ones and I often find myself smiling when I do something that has a link to the time I spent with him. Things like drinking Carnation evaporated milk or eating fish and chips at the seaside. When he died, it was sudden and quick. He had a heart attack and a stroke and at the grand age of 80 something, that was the sad but natural way of things back then. I didn’t see him in his last hours and up to the day he died, he was still very active and living a good life. So yes, it was very sad and I cried a lot. But I have my memories that make me smile. However, if he had had a heart attack and/or stroke today, the likelihood is I would be visiting him in a hospice and he would be hooked up to various pipes and tubes that were keeping him alive. He would likely be taking a cocktail of drugs and unlikely to be looking after his personal needs. 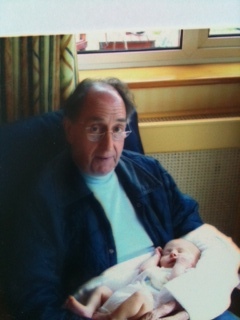 My father is now a grandfather and when his grandchildren see him, they see a frail and infirm old man with dementia. A man who has suffered from at least one stroke and has to have weekly injections to keep one part of his body free of cancer and needs reminding what pill to take and when, to keep his other ailments at bay. My overriding memory of growing up with my father is someone who inspired and encouraged me, listened to every poem I wrote and was always there when I needed to talk about something, however trivial or crucial. He was active and highly intelligent and whilst he was also a ‘grass is always greener’ kind of person which was sometimes a little frustrating, he helped to make me what I am and for that I am grateful. But why do I find myself clinging onto these happy memories when he is still alive? Perhaps because the man who I see now is not the man I grew up with, the attractive and imposing figure is now a skeletal bedraggled person who stoops and stumbles and has to hold out for support. His great mind is now struggling to find the right words to describe something as simple as a bin liner and he sits in his chair unable to rationalise the most simple aspects of his life. The doctors and health specialists do what is necessary when they are called, but everything they do is reactive and usually well after the event. They have so little time and limited budgets to deal with the ever increasing demands of our burgeoning elderly population. My sister made a profound observation: 30 years ago, life expectancy was lower, we knew where we stood, we knew what to expect, but now with so called medical advances, we can all expect to live way beyond our body’s natural span. But it is unknown territory, the situation we find ourselves in now is unprecedented. But 30 years ago, no one looked at the bigger picture i.e. what happens when we have managed to keep everyone alive who might otherwise have died? How do we cope with their ongoing medical needs that will be 100 times greater? The scientists, medical experts and drug companies saw themselves as saviours, demanded recognition for their greatness in prolonging life. They were the demi-gods we should all be praising and thanking. Apparatus = elderly infirm population. Method = how to combat diseases affecting the elderly. Results = hundreds of medicines manufactured. Conclusion = millions of people kept ‘alive’. But what of the consequences oh you gods of medical excellence? The drug companies make £millions = the NHS need to find £millions. The memories of my grandfather remain happy and positive. The memories of my father are being eroded because he has been kept alive but is his ‘life’ really what he wants or what the medical world say he should have? I’m sure I am not the only one who may not like to admit it, but we are now in a crisis and the raw truth is it’s going to get worse for the next generation of elderly people. Does anyone care to make a suggestion? This entry was posted in Dementia, Health and tagged dementia, doctor, elderly, hospice, illness, medicine, mental health, NHS, nursing home. Bookmark the permalink.